Simple wizard for making backup jobs. Easy restoration via ZIP file. Trigger backups during certain conditions. Can't password protect the program interface. 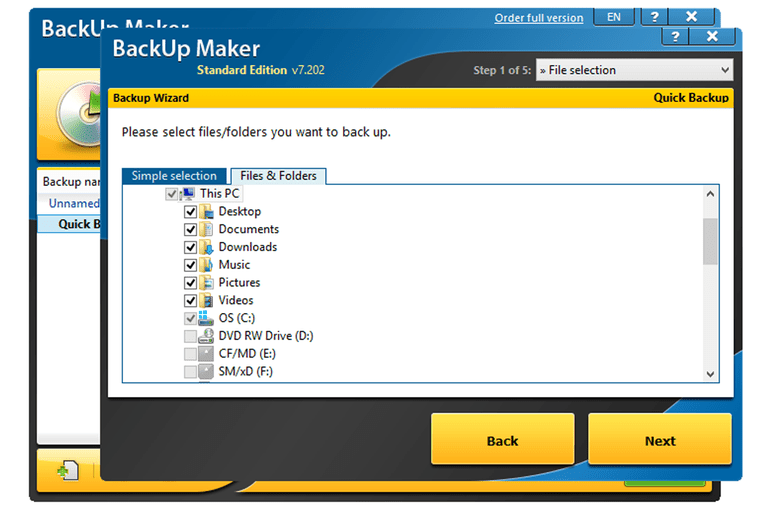 BackUp Maker is free backup software that supports a variety of backup destinations. There are unique settings in BackUp Maker that I haven't seen in similar programs, like running a backup using conditional settings and system events, like USB detection. This review is of BackUp Maker v7.405. Please let me know if there's a newer version I need to review. Full backup, incremental backup, and differential backup are supported. Data can be backed up from a local hard drive, network folder, or external drive. BackUp Maker can create a ZIP backup on a local or external drive, CD/DVD disc, network folder, or FTP server.